Rain...Snow...Sleet or Hail we are here to help! they would be called "scheduled disasters." No one likes surprises in their parking lots, however, emergencies seem to always happen at the most inconvenient time. If you find yourself in a situation where a Life Safety Issue (LSI) exists, rest assured, we will be there for your emergency pavement and concrete maintenance. Snow pushers and skid steers are great for quick and efficient snow removal. When they are operated carelessly they can cause significant damage to catch basins. Catch basin repairs can typically be completed the same day they are called in for service. We work with you to get you the most cost-effective fix, should you have more than one damaged catch basin or storm drain. 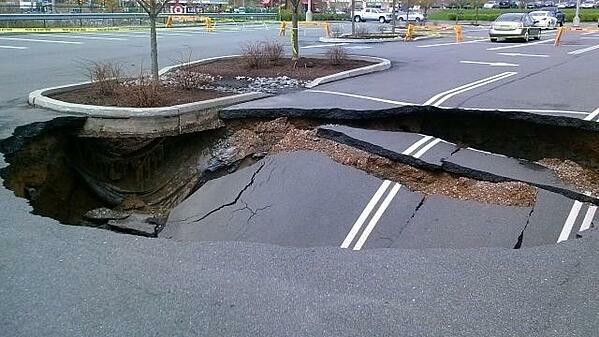 During the freeze thaw cycle and extreme cold fronts, water seeps into cracks in the asphalt. 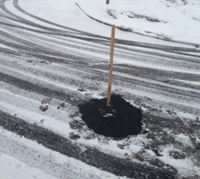 The broken asphalt loosens and then is dislodged from either vehicle or snowplows. We can make immediate repairs with cold patch, and then return the following day(s) when the temperatures rise and make the permanent pavement repairs with hot-mix asphalt through traditional cut & patch repair or infrared asphalt restoration. *Each state we work in (NJ, PA, DE & MD) has 1-3 different asphalt plants which remain operational on any days where the temperature is above 35 degrees F.